FCCLA members and preschool students show off their carved pumpkins. Supergirl made her way towards the candy that was waiting for her across the lawn. As she stepped onto the porch, everything got darker and the crickets became louder. She quickly turns around and in the corner is a pair of yellow eyes. The door finally opens before she screams. She laughs because those aren’t monster eyes – it’s a carved pumpkin! 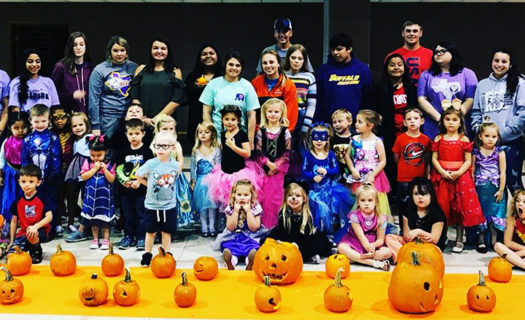 Last week, FCCLA members had the opportunity to travel to the First Baptist Church and carve pumpkins with the preschoolers. At the gym inside the church, each high school student was paired with a preschooler. The members carve the pumpkins while the preschoolers were picking out the” brains”-the proper name of the fibrous strands and seeds. To decorate the pumpkins,the kids told the FCCLA members what they wanted and tried to their best to resemble it. Students used carving pumpkins as an opportunity to get to know the preschoolers better. The FCCLA program works to have community service events every month of the year in order to learn the skills of interacting, creating relationships and communication.